UPDATE: Unborn child died after attack, as well as one of the women. He is also the suspect in an execution of two employees at a gas station nearby. Lake Wales, Florida – The suspect in a Polk County triple attempted murder has surrerendered to sheriff’s deputies. Investigators say he set fire to an insurance business in Lake Wales. Two women were burned, and one man shot during the attempted robbery. One of the women is pregnant. The women are now at a burn center in Orlando. Davis has a long criminal history in Polk County, and was just released from jail on December 3rd. 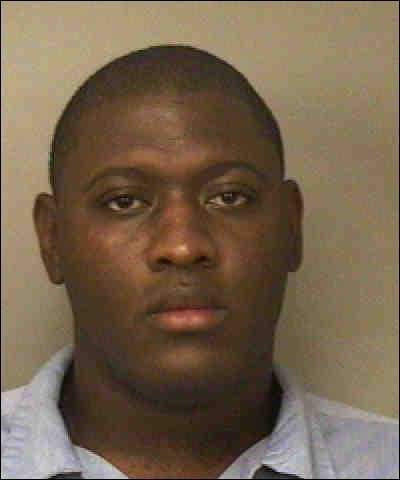 Leon Davis Jr., whose 30th birthday is Friday, surrended at a Polk County Sheriff’s Office station off Thompson Nursery Road, according to Lake Wales police. The women were Jane Lucino, 23, who is six months pregnant, and Yvonne Bustamonte, 26, said Scott Headley, owner of the Nationwide Insurance business were the attack occurred. “I can’t imagine someone can do something so cruel,” Headley said. Arresting Agency: LAKE WALES POLICE DEPT. Arresting Agency: LAKELAND POLICE DEPT. Instead of helping the victim, liberals are obsessed with “helping” the criminal by not having even “tough love” for people who still have a chance but instead coddling them, reinforcing their violent and selfish behavior. I told that joke to a liberal once, a fine arts librarian at a local public library who just sat around all day on the job, and she replied, “yeah, they do need help.” She didn’t get the joke. This is no laughing matter. This sick turd needs to go away for life. Triple attempted murder may not keep him there as long as if he had murdered them, it should. The damage he has done deserves for him to be put away for the rest of his life. Sickening. Imagine black oil washing up onto the shore of Key West and other beaches in South Florida, choking and killing thousands of birds, fish and other wildlife. It would be the Exxon Valdez all over again, but this time instead of off the Alaskan coast, it would be on the beautiful beaches of South Florida. Florida would then lose billions of dollars in tourism dollars and would need federal dollars to help clean up this mess. That’s what could happen if China gets its way and begins drilling north of Cuba, just 45 miles from Key West and an accident occurred. It’s bad enough that China wants to drill for oil just miles from the the United States. “Any oil spill 45 miles from Key West is going to absolutely devastate all those delicate coral reefs, the fragile Florida Keys, and would endanger pristine beaches all the way up to Fort Pierce,” said Nelson, a Democrat. Cuba pumps about 80,000 barrels of oil a day in Havana and Matanzas provinces, but it is of poor quality and meets less than half of the country’s needs. Thus there has been considerable excitement about fields off the northwest Cuban coast that could contain 4.5-billion to 9-billion barrels of oil – almost as much as in the Arctic National Wildlife Refuge in Alaska. 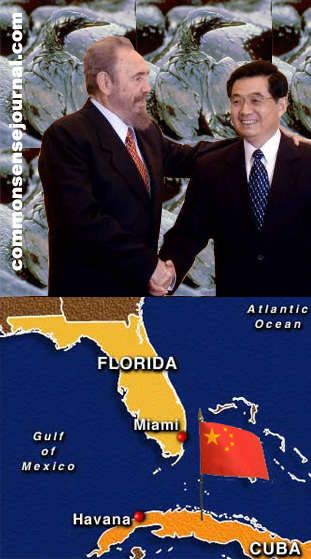 In February 2005, Castro announced that huge Chinese drilling rigs would be used to further explore areas in which a Spanish company had reported promising results. The Cuban government also signed a contract with China’s oil and gas company, Sinopec, to work in areas around the island thought to contain oil deposits. We should prevent them from drilling anywhere near the U.S. Coast, with military ships if neccessary. Why not? It threatens billions of dollars in tourism revenue, plus I don’t want anything Chinese that close to our shores.